Spix & Wagner, 1827, Test. Fluv. Brasil. : 29, pl. 22, fig. 2. Gray in Griffith & Pidgeon, 1833, [in] Cuvier, Animal Kingdom 12: pl. 19, fig. 3 [as ‘georginæ’]. 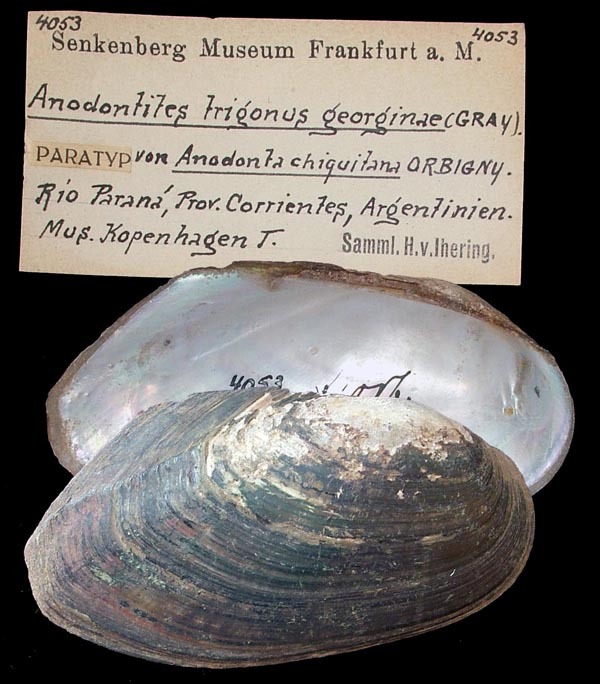 Gray in Griffith & Pidgeon, 1834, [in] Cuvier, Animal Kingdom 12: 595 [as ‘georginæ’]. d’Orbigny, 1835, Mag. Zool. 5(61-62): 41. Type(s): SYNTYPE SMF_4053, Rio Parana, Prov. Corrientes, Argentinien. 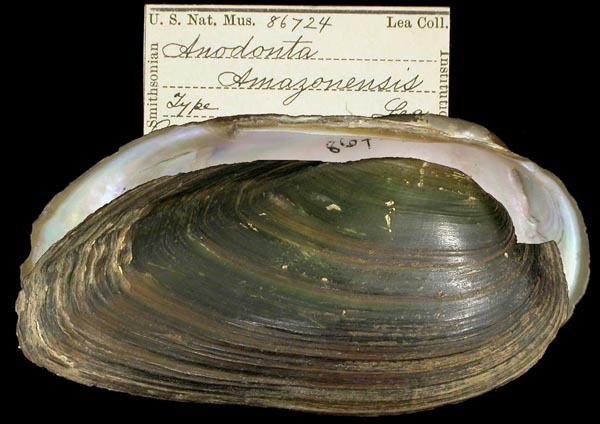 Type(s): SYNTYPE SMF_3822, Maloya Sumpfe, Prov Corrientes, Argentinien. Swainson, 1840, Treat. Malacol. : 381 [as ‘Patularia ovata’]. 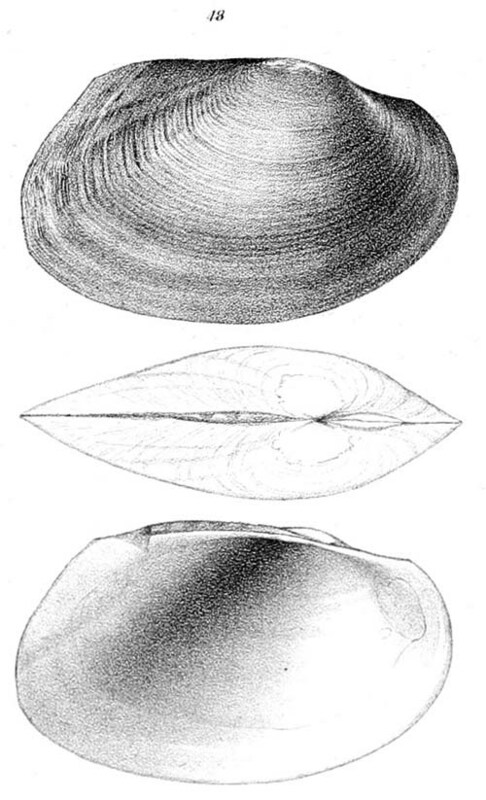 Swainson, 1841, Ex. Conch. : 30, pl. 36. Lea, 1852, Trans. Amer. Phil. Soc. 10 [O. 5]: 287, pl. 26, fig. 48. Lea, 1852, Synopsis Fam. 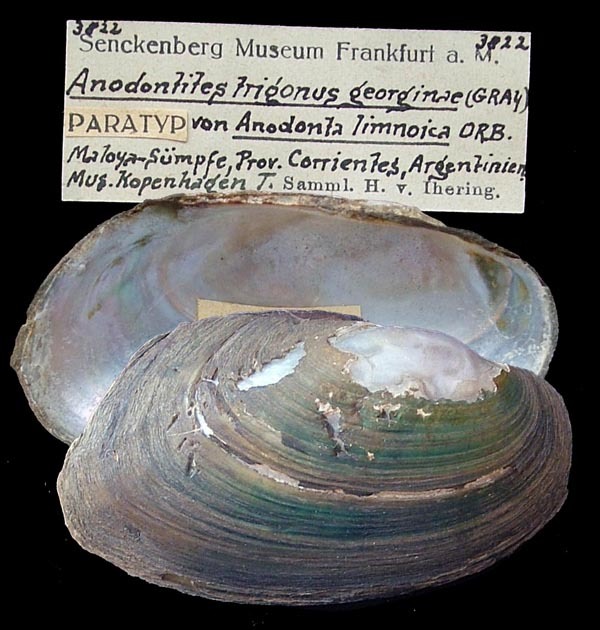 Naiades: 51. Hupé, 1857, [in] Castelnau, Amim. Nouv. Rares d’Amer. Sud: 88, pl. 18, fig. 4. Hupé, 1857, [in] Castelnau, Amim. Nouv. Rares d’Amer. Sud: 89, pl. 18, fig. 1. Hupé, 1857, [in] Castelnau, Amim. Nouv. Rares d’Amer. Sud: 87, pl. 14 , fig. 3. ‘Lea’ Hupé, 1857, [in] Castelnau, Amim. Nouv. Rares d’Amer. Sud: 90. 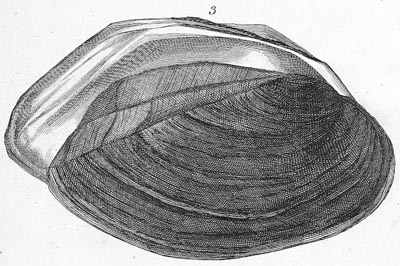 Chenu, 1858, Illustr. Conchyl. : pl. 3, figs. 1-1b. Lea, 1860, Proc. Acad. Nat. Sci. 12: 89. Lea, 1863, Jour. Acad. Nat. Sci. 5 [O. 10]: 395 , pl. 46, fig. 300. 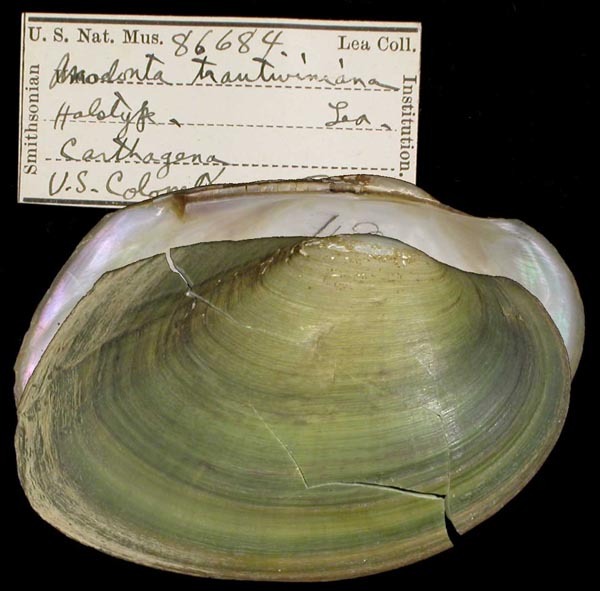 Type(s): HOLOTYPE USNM_86724, Upper Amazon, Brazil. Philippi, 1869, Malak. Blatt. 16: 40. Philippi, 1869, Malak. Blatt. 16: 39. Pfeiffer, 1869, Novit. Conch. 3: 486, pl. 105, figs. 1-3. Pfeiffer, 1869, Novit. Conch. 3: 486, pl. 105, figs. 4-6. Sowerby, 1870, Conch. Icon. 17: pl. 30, sp. 120. Simone, 2006, Land. Freshw. Moll. Brazil. : 284. ‘Lea’ Sowerby, 1870, Conch. Icon. 17: pl. 33, sp. 134. 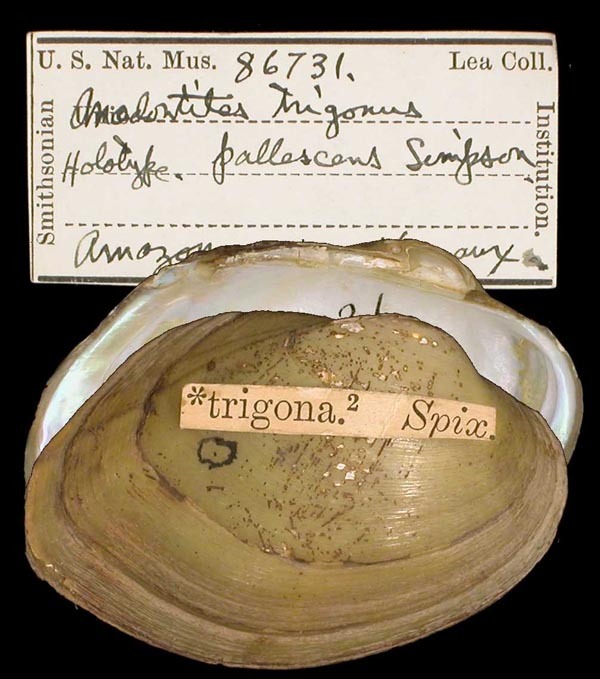 ‘d’Orbigny’ Simpson, 1900, Proc. U.S. Nat. Mus. 22: 928. ‘d’Orbigny’ Simpson, 1914, Descr. Cat. Naiades: 1441. Simpson, 1900, Proc. U.S. Nat. Mus. 22: 922. Simpson, 1914, Descr. Cat. Naiades: 1427. 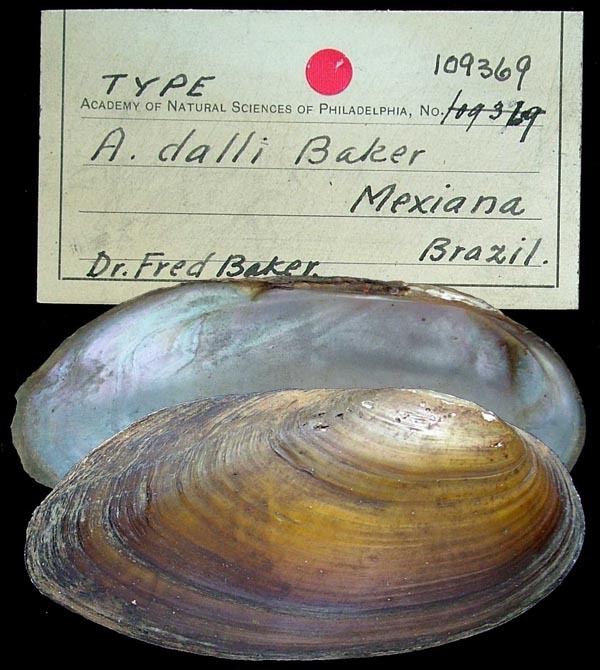 F. Baker, 1913, Proc. Acad. Nat. Sci. 65: 667, pl. 27, figs. 1-2. Simpson, 1914, Descr. Cat. Naiades: 1442. 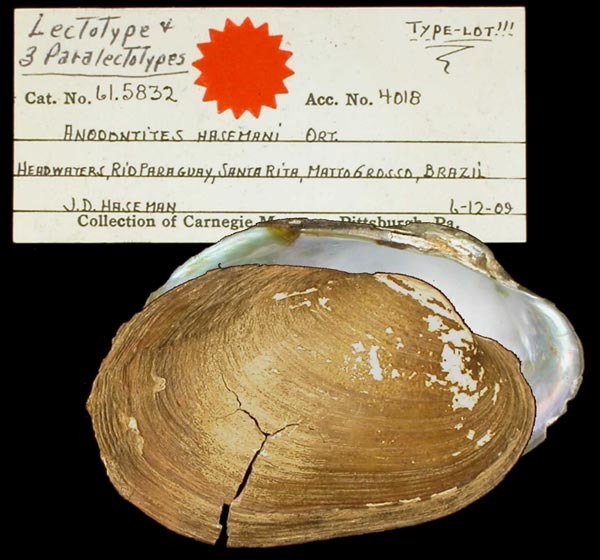 Type(s): HOLOTYPE (MONOTYPY) USNM_86731, Amazon River. Ortmann, 1921, Mem. Carnegie Mus. 8: 609, pl. 42, figs. 6-7. 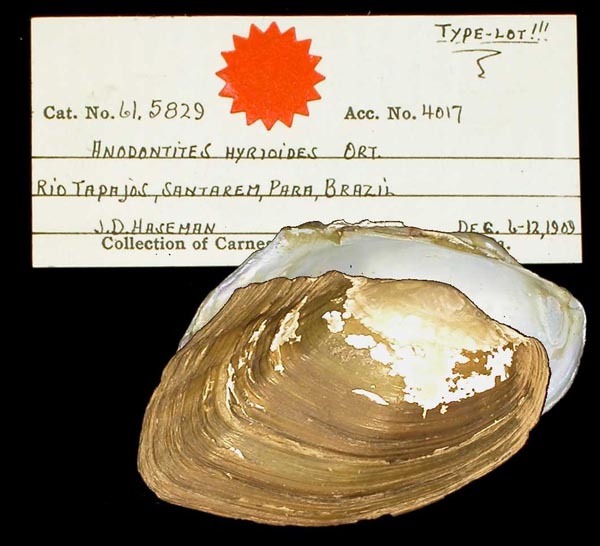 Type(s): LECTOTYPE CM_61.5832, headwaters of the Rio Paraguay, Santa Rita, Matto Grosso, Brazil. Ortmann, 1921, Mem. Carnegie Mus. 8: 604, pl. 42, figs. 3-5. Type(s): LECTOTYPE CM_61.5229, Rio Tapajós, Santarem, Pará, Brazil. ‘Lea’ Sowerby, 1870, Conch. Icon. 17: pl. 33, sp. 134 [as ‘Anodon trautwinianus’]. Frierson, 1922, Nautilus 36: 9. Doello-Jurado, 1924, Physis 7(25): ??. ‘Philippi’ Simone, 2006, Land. Freshw. Moll. Brazil. : 284. Rumi et al., 2008, Rev. Biol. Trop. 56(1): 85.